The simplest river-of-news RSS reader for busy Mac people. Fast and Simple Whether you have just minutes to skim headlines, or hours to puruse articles, SushiReader's river-of-news presentation style makes it easy. Start from the latest and the most important articles, and just stop anytime you wish. Priority Subscriptions Mark important subscriptions as priority, and SushiReader will make sure you get to the important headlines first. Timelines Place different subscriptions in different timlines, you can easily switch between different interests. No Mark-All-As-Read Button SushiReader will always show you the latest and high-priority headlines first. Articles you have no time to get to will be silently removed after a period. SushiReader will never nag you about how many articles you haven't read. 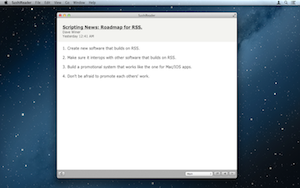 More Supports RSS and Atom formats. Supports simple feed discovery. Import and export OPML subscription lists. Keyboard shortcuts for mouse-free navigation. Show or hide images. Full-screen view. You can purchase SushiReader on the Mac App Store. SushiReader v2.0.2 requires OS X 10.8 (Mountain Lion). You can also download a demo version of SushiReader. Email me at sushireader@myapplemenu.com for assistance, reporting of bugs, or to offer feedback and suggestions. Thanks. Version 2.0.2 Added window to view list of subscriptions that is being refreshed. Updated full-screen view. General bug fixes, including always opening URLs in the background when command-clicking, and better handling of articles without titles. Version 2.0.1 General bug fixes, including correcting a bug where subscriptions fail to refresh, a bug where importing of OPML failed, and a bug where moving a subscription to a newly-created timeline failed. Version 2.0.0 Simplified interface, simplified prioirty system, and multiple timelines.